Honestly, I didn’t think they would close Paint the Night. I was surprised when Disneyland extended the 60th anniversary celebration well past their 61st birthday, but the thought they would close down the ever popular Paint the Night parade never crossed my mind. I guess I was spoiled by the almost 30 year run of the Main Street Electrical Parade (24 at Disneyland and then another 10 at Disney’s California Adventure). Paint the Night seemed to be the heir apparent to the Electrical Parade, but apparently – at least temporarily – it will close on September 5th. Interestingly, there hasn’t been a big announcement or a press release or a special viewing party for the final show, causing speculation among fans (see the Disney Parks Blog) that it may return sooner than expected. But several reports on Twitter by Disneyland Today and confirmation by Shawn Slater who is the Senior Communications Manager for Walt Disney Imagineering Creative Entertainment confirm the show will close along with the special edition of World of Color and the Disneyland Forever Fireworks show. For the other two shows, the original World of Color show will be returning as will the Fantasy in the Sky Fireworks which has been a classic for years. Both shows will run Friday night through Sunday night beginning September 9th. Fantasmic! is slated to also return but not until the summer of 2017 when the Rivers of America will reopen with the new riverbank and elevated trestle. In the meantime, no new nighttime parade has yet been announced although it is likely with the holidays arriving there may be a short Halloween themed parade until mid November when it is likely Disney’s Christmas pageantry will be in full swing. Paint the Night has brought in many Disney fans – both Annual Passholders and outside visitors who want to see this beautiful parade. With any luck the wait between now and its renewal will be short. In the meantime, make sure to go and see it one last time before the closing night of Sept 5th! 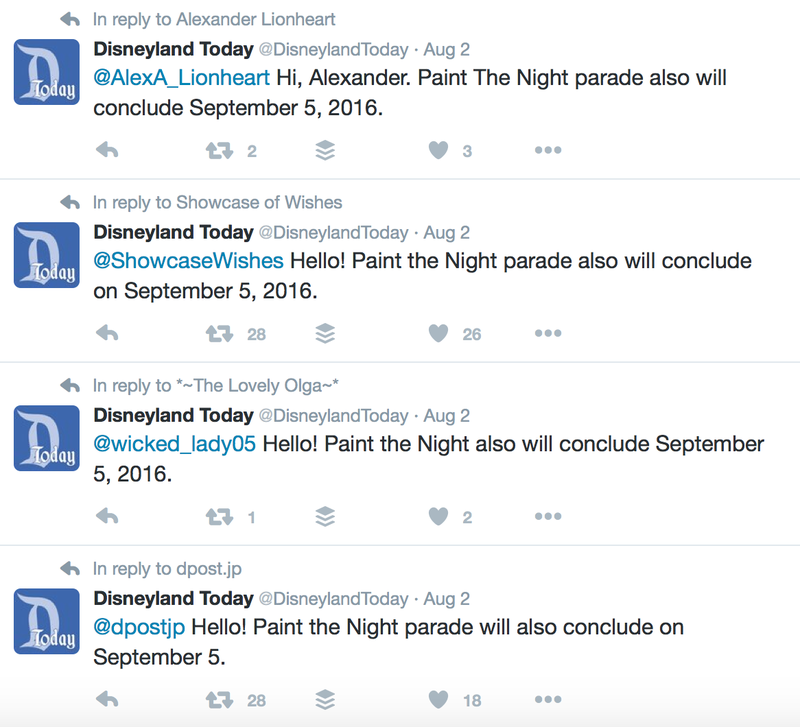 I’m sorry to see that the PTB have decided to end Paint the Night. 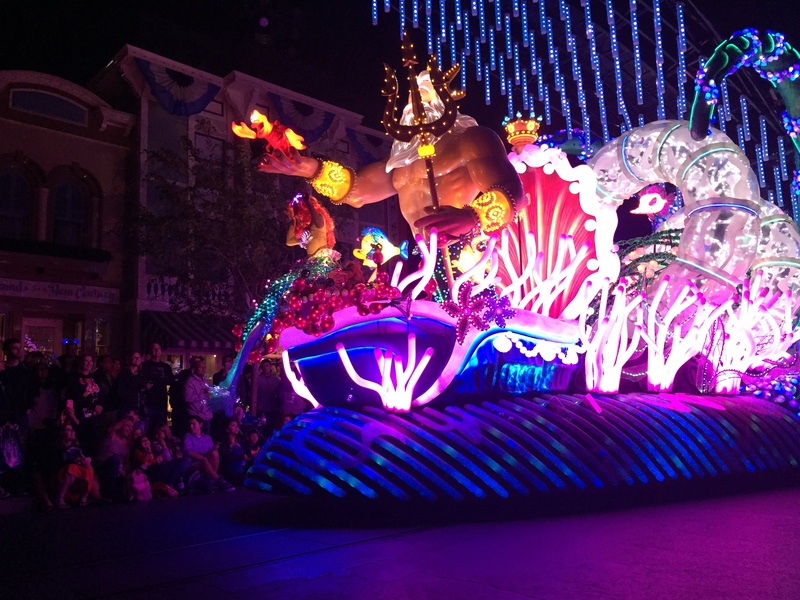 It is such a great parade and I love that it brings back memories of the Main Street Electrical Parade and that they had managed to entwine the Baroque Hoedown into the music. But on the other hand I am thrilled they are bring back the original World of Color show. I hope so, too. But with the Halloween party season coming, they’ll be doing a Halloween cavalcade most likely at night anyway instead of a full-blown parade.